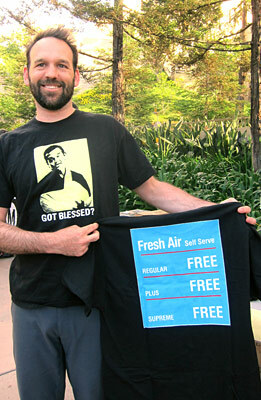 Car-free cyclist Nate Baird, an LADOT bike program planner, wears his blessings at Good Samaritan Hospital bike week event. Avid cyclist Andy Leeka, CEO of Good Samaritan Hospital, rides to his job in downtown Los Angeles most days of the week. He was there on cue to welcome scores of cyclists this morning arriving en masse for an interfaith blessing, breakfast and a bike check. The interfaith ceremony bestowed blessings from a Catholic priest, an Episcopalian priest, an Iman, a rabbi, and a Buddhist monk on groups of bicycle clubs and cyclists from nearby and as far way as Ventura and the Channel Islands. I think that LaBonge is on the left, not the right. You’re so right, Joe! Fixed! Why is a religous activity being supported / touted by a tax payer funded public institution? Which faith leader is that wearing the robe that has a DNA double helix as decoration around its border? 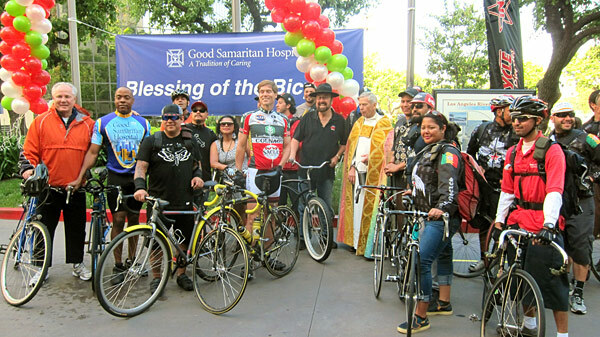 A previous year’s photo in Downtown News of the Blessing of the Bicycles also included that robe without identifying the wearer. Which religion honors DNA? I’m sorry, we don’t have identifying info for those in the photo. Bike Week is a great event it promotes a healthy lifestyle and Metro is doing a great job with funding bike lane projects. Keep up the good work Metro.